Chatbots, or “bots” for short, are computer programs that interact with people in a way that mimics human interaction to some degree. The interaction can vary in complexity from simple keyword-driven queries to elaborate conversational systems using natural language processing and AI techniques. This conversational form of human-computer interaction can act as a framework for many types of useful applications. Early chatbots included academic curiosities like Eliza (1964) and Julia (1994), but now bots are at work all over the internet in customer support, as virtual assistants like Google Assistant, and in many other roles. Bots in Hangouts Chat appear as special users marked BOT. Just like people, bots can participate in chat rooms, and they can respond to direct messages. But unlike people, bots only see messages directed to them when a person @mentions them in a chat room, or when a person sends them a direct message. By default, bots can only read the basic identity of users that invoke them. This information includes the user's display name, user ID, email address, and avatar image. If a bot needs to access other data to do its job, it can prompt the user to grant it additional access. Bots aren't associated with any particular user: anyone can add a bot to a room or remove it. Once the bot is added to a room, anyone can @mention it. Adding bots to a conversational platform like Hangouts Chat lets people ask questions, issue commands, and so on without changing context. On its back end, a bot can access other systems, acting as an intermediary to those systems. Look up information — A chatbot can retrieve information based on structured or free text queries entered by the user. File ticket — A chatbot can generate a new incident report or other artifact, using information provided by the user. Coordinate effort — A chatbot can enhance the way that team members interact with each other, by providing “team memory”, scheduling resources, and so on. If you're considering building a Hangouts Chat bot that will integrate with G Suite, consider implementing the bot in Apps Script. This provides your bot with easy access to G Suite services and data such as Sheets, Slides, Docs, and Calendar. See Bot implementation architectures for more on this topic. Bots should also provide a help command or the equivalent to help users get started using the bot. Bots can receive messages from, and send messages to, Hangouts Chat. These messages use defined message formats, which may render as simple text messages or interactive cards in Hangouts Chat. You can configure a bot so that it responds to direct messages. This provides a one-to-one conversational interface that involves a single user. HTTP (web service) endpoints can accommodate various styles of interaction. Cloud Pub/Sub endpoints let your bot subscribe to a topic that relays messages from Hangouts Chat, even if the implementation is behind a firewall. 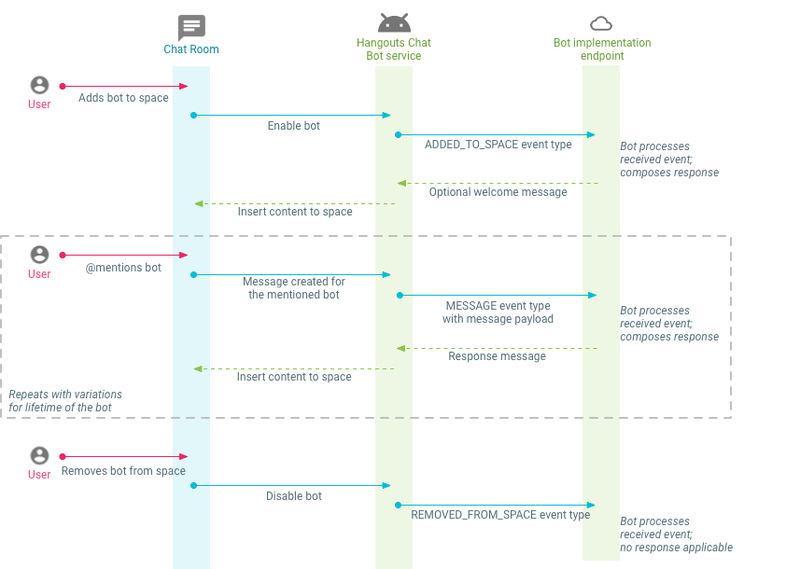 See the Endpoint types section for more about the different ways you can connect Hangouts Chat with your bot.